Perfect for daily indoor cleaning of hotels, restaurants, schools, shopping malls, exhibition centers, as well as schools and government institutions. VIPER LS 160HD is a low speed single disc machine designed for medium-duty and heavy-duty applications. Through professional design, we can offer the machine with attractive quality/price level. Operation is simple and easy to use controls. 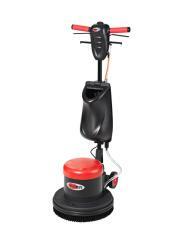 The VIPER LS160HD single disc is robust, reliable and service friendly, with the ergonomic design, you can easily scrub floors. the machine is ready to use, water tank, brush and pad holder come with the machine. You can also choose the optional foam generator and optional weights. Simple and user-friendly: The machine is automatically locked off when the handle is in 90 degree vertical position.